To celebrate the release of Sony Playstation game Far Cry 4, Ubisoft partnered with wild English inventor Colin Furze on creating a weaponized tuk tuk that in-game hero Ajay Ghale uses to combat the Royal Army of Pagan Min. The original engine in the Bajaj tuk tuk - usually good for something like nine or ten horsepower to move around 600 pounds - came out, replaced by the 100-horsepower engine from a Honda CBR 600. That is where the wheelies, drifting and burnouts come from. And because it isn't wise to take on a warlord's army and ravenous beasts with a standard auto rickshaw, the red wonder gets Uzis that slide forward to shoot through holes up front, side-mounted AK47s and rear-facing flamethrowers. You can witness the carnage that results in the video here, and check out the series of build episodes advertised at the end. 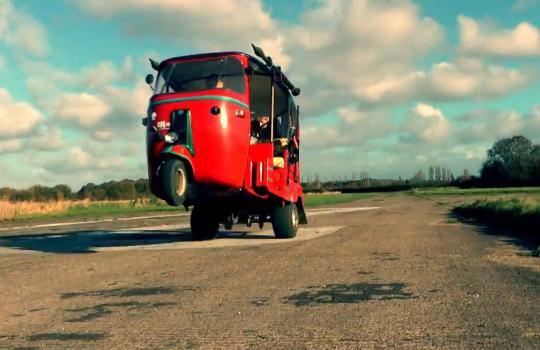 To celebrate the release of the Playstation game Far Cry 4, Ubisoft partnered with wild English inventor Colin Furze on creating a weaponized tuk tuk that in-game hero Ajay Ghale uses to combat the Royal Army of Pagan Min. The original engine in the Bajaj tuk tuk - usually good for something like nine or ten horsepower to move around 600 pounds - came out, replaced by the 100-horsepower engine from a Honda CBR 600. That is where the wheelies, drifting and burnouts come from. And because it isn't wise to take on a warlord's army and ravenous beasts with a standard auto rickshaw, the red wonder gets Uzis that slide forward to shoot through holes up front, side-mounted AK47s and rear-facing flamethrowers. You can witness the carnage that results in the video, and check out the series of build episodes advertised at the end.